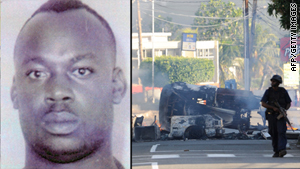 The death toll in Jamaica has reached 76 during a quest to arrest suspected drug kingpin Christopher Coke. (CNN) -- Security forces in Jamaica plan to renew a push Monday to arrest an accused drug lord at the center of violence that has now killed 76 people, the country's police commissioner said. Police officers and soldiers plan to launch the second phase of an operation Monday aimed at executing an arrest warrant for Christopher "Dudus" Coke, a suspected drug kingpin who is wanted in the United States, police commissioner Owen Ellington said. The death toll has risen to 76 as a result of violence triggered by Jamaican authorities' attempts to arrest Coke, Ellington said. The dead include 73 civilians, two police officers and one soldier, he said. Authorities have detained more than 700 people, he said. Clashes have unnerved residents in the Kingston neighborhoods of Tivoli Gardens and Denham Town. Violence flared there after authorities tried to arrest Coke, who was charged last year in U.S. federal court with conspiracy to distribute marijuana and cocaine and with conspiracy to illegally traffic in firearms. Authorities in Jamaica sought to arrest him after federal prosecutors in New York sought his extradition, but his supporters attacked police stations in response. Coke has a heroic reputation in Kingston's slums. He has been likened to Robin Hood and Jesus because he has helped the community by handing out food, sending children to school and building medical centers. The plans for a new push to arrest Coke unfolded amid credible evidence that criminals from around the country have converged on Tivoli Gardens to help him avoid arrest, Ellington said in a press briefing with reporters. At that briefing, Ellington reiterated government denials that members of the security forces have burned bodies. Some people in Tivoli Gardens told CNN this week that they saw security forces torch dead people and that they feared the authorities were burning bodies to cover up the extent of the violence. "I literally saw them wrap up men in sheets and put tires on them and burn them," one man said, adding that the people were already dead when their bodies were burned. He and others who described burning bodies declined to be identified for fear of reprisals from the authorities. Reports that authorities have burned or secretly buried bodies are false, Ellington said. Several senior officials who investigated the reports found no sign that they were true, he said. The violence that gripped much of Kingston for much of the last week seemed to have largely abated Friday. Charred debris, broken windows and deserted streets served as a reminder of an anxiety still felt by some, but businesses in Kingston's main commercial district were open, and officials expressed hope for a sense of normalcy. The president of Jamaica's Chamber of Commerce, Milton Samuda, said more businesses reopened Friday. "I anticipate and hope that it will be fully back to normal by Monday," he said.